June is around the corner! The OpenNebulaConf US will take place on June 19-20 in Cambridge, Massachusetts. You can already check the agenda with keynotes by Akamai, Telefonica and Harvard, and still benefit from the early bird registration until 12th of May. The following OpenNebula TechDays are drawing a lot of attention. Madrid (hosted by Telefonica), Sofia (hosted by Storpool) and Barcelona (hosted by CSUC) registrations are almost full, check the agendas if you are interested in attending. OpenNebula new major release is almost in feature freeze, and the numerous new additions are being stabilized. The vCenter driver is getting a major revamp in terms of storage and network management (check out more details in this article), non persistent disks and storage quotas, as well as network creation, mean an important boost in vCenter support. These new features will enhance OpenNebula provisioning model over vCenter based infrastructures, increasing the already wide range of use cases that can be implemented. OpenNebula HA configuration in the front-end has been possible for quite a while. It currently relies on external components to ensure this HA, but the team decided that we may as well go all the way and implement HA natively in the OpenNebula front-end, implementing a consensus algorithm directly in the ‘oned’ core. The key improvement is the easier setup of the HA and the reduction of third party dependencies (no fencing, no corosync needed) and even more importantly, much less painful (in fact, completely ) failure recovery. Extensive testing is now performed on this functionality so you can add yet another 9 in your OpenNebula cloud availability! 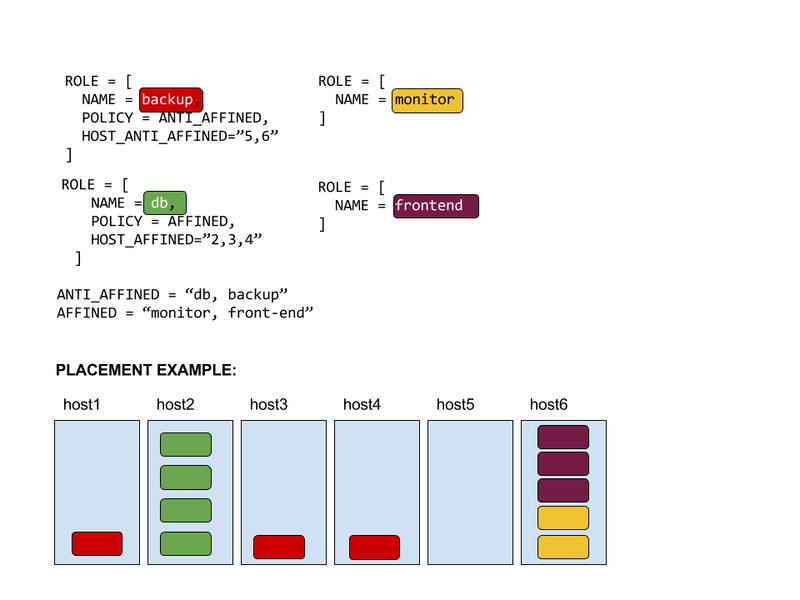 More exciting features in 5.4 are: VM to VM and VM to Host affinity/antiaffinity using VM Groups, image persistency selection, modifiable semantics for permissions, IPv6 non SLAAC Address Ranges, Linked Clones support, improvements in monitoring drivers and much more! Check out in the project’s development portal all the things we are still working on. Building a ecosystems is instrumental in the success of a open source project. Thanks to people interested in OpenNebula, the amount of use cases that can be built with OpenNebula keeps growing and growing. For instance, Devuan support is now a reality in OpenNebula, with support packages that ensures a proper contextualization of this novel and refreshing linux distribution. It is always with pleasure hearing how people learn about OpenNebula, and realize that we’d been making cloud computing easier for you for quite a while now. Also, and as always, we love to see our friends at NodeWeavers being so supportive all over this last years. Kudos! We would like to thank everyone that is actively supporting new OpenNebula users (or more seasoned users) in our support forum. Your actions are extremely useful for the adoption of OpenNebula around the globe! An indicator of the health of the development community is the number of open pull requests in the OpenNebula GitHub page. We do our best to review and incorporate those aligned with the OpenNebula roadmap. Thanks! The first US edition of the OpenNebulaConf is happening this 2017, as one of two OpenNebulaConf editions this year, one in US and the other in Europe. The US edition will take place on June 19-20 in Cambridge, Massachusetts, and the european edition will be held in Madrid, Spain, on October 23-24. The next editions OpenNebula TechDays events of 2017 are shaping up as special ones for the agnda and expected turnout. Madrid (hosted by Telefonica), Sofia (hosted by Storpool) and Barcelona (hosted by CSUC) registrations are almost full, check the agendas if you are interested in attending. 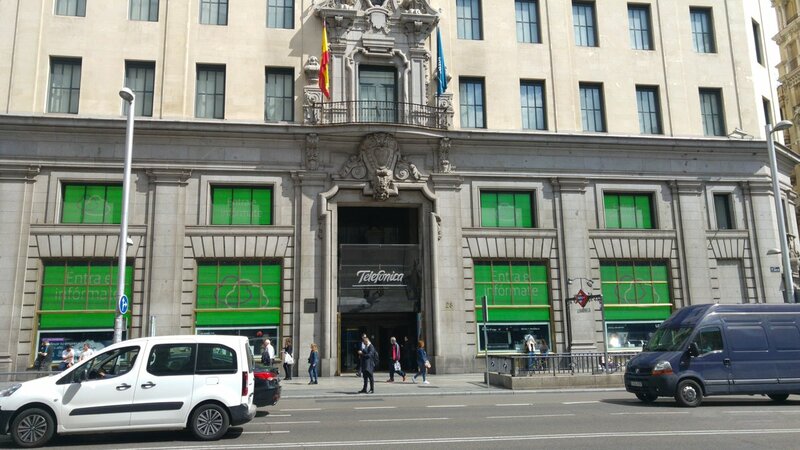 We will be publishing details about the venues shortly, we just leave here a picture of the Madrid venue by Telefonica which is in a privileged location. OpenNebula was present at the Enterprise at OSEN meetup, where people learn best practices as well as share with others their successes and failures with building open source products. The OpenNebula Project is proud to announce the first agenda and line-up of speakers for the fifth OpenNebula Conference to be held in Cambridge, MA from the 19 to the 20 of June 2017. Guided by your feedback from previous edition, we included more educational and community sessions to learn and do networking. James Cuff from Harvard FAS Research Computing will discuss their strategy moving forwards and the current and existing infrastructures in place to allow for seamless provisioning of research computing. Justin Riley from Harvard FAS Research Computing will give a keynote about how they converted their internal VM infrastructure from a completely home-made KVM cluster to a more robust and reliable system powered by OpenNebula and Ceph configured with public cloud integration. .
Alfonso Aurelio Carrillo Aspiazu from Telefonica will give a keynote about how they use OpenNebula and ON.Lab’s ONOS to prototype a new generation of Central Offices. We have also increased the number of educational contents with presentations from the OpenNebula team showing and demoing some of the most demanded features and latest integrations. We had a big response to the call for presentations. Thanks for submitting a talk proposal!. Although all submissions were of very high quality and merit, because this year we increased the educational contents we only have space for a few community presentations. Jordi Guijarro from CSUC, Roy Keene from Knight Point and Hayley Swimelar from LINBIT will discuss their experiences and integrations with OpenNebula. We will also have two Meet the Experts sessions providing an informal atmosphere where delegates can interact with experts who will give their undivided attention for knowledge, insight and networking; and a session for 5-minute lightning talks. If you would like to talk in these sessions, please contact us! Besides its amazing talks, there are multiple goodies packed with the OpenNebulaConf registration. You are still in time for getting a good price deal for tickets. There is a 20% discount until May 12nd. We are looking forward to welcoming you personally in Boston! This monthly newsletter features the latest developments in the OpenNebula project, highlights from the community and the dissemination efforts carried out in the project this past month. As you may know, the first ever US edition of the OpenNebulaConf will take place on June 19-20 in Cambridge, Massachusetts. Check out the keynotes by Akamai and Harvard, and reserve your seat in Boston! The complete agenda will be out in a few days. OpenNebula 5.4 is going to place a new mark in cloud management excellence. A wealth of new features are being now stabilized, and that is what’s keeping the development team busy these days. As you know, the vCenter driver is getting a major revamp in terms of storage and network management (check out more details in this article). These new features will enhance OpenNebula provisioning model over vCenter based infrastructures, increasing the already wide range of use cases that can be implemented with your favourite Cloud Management Platform. .. and there will be more before the beta is released by the end of the month! The team is particularly excited about the scheduler new ability of creating VM Groups with roles in which you can define affinity/anti affinity between VMs and virtualization hosts. This way OpenNebula supports use cases where VMs needs to be placed together for license issues, network performance reasons (place the DB and server together for instance), computational reasons or a wide range of other use cases. As usual, a picture speaks a thousand words. This feature has been sponsored by BlackBerry in the context of the Fund a Feature program. New advancements in the community are always a pleasure to review, it is the time to notice that the OpenNebula community is as supporting and caring as always. Newcomers surely feel the warmth of the support forum, where users, developers and integrators give their best to aid users with questions and problems about OpenNebula and really interesting use cases. We’d like to show this spirit with this thread, where people show their best to help use OpenNebula with resources from a hosting company. Way to go! It is always a pleasure learning how OpenNebula is used in a wide range of industry niches and institutions, like it use in the Turin INFN science cloud. Building reliable and useful, real world clouds is our main goal all along!. An excellent post describing the hybrid model and why is interesting for enterprises and institutions is featured in the OpenNebula blog this month. The hybrid model in OpenNebula is a native capability, which can leverage the traditional cloud promise: infrastructure elasticity. The idea of combining resources of public cloud providers with private depending on the terms of execution, the need of more resources, an extra protection of the data, more or less security in services with sensitive information, etc. are some of the capabilities that this model has to answer. NodeWeavers shows us how to create an OpenNebula cloud in record time. Whoa! Their portable cloud looks nifty indeed! We are very proud to announce that OpenNebula is a key components of the recently announced Telefonica rendering of the CORD framework (R-Cord)! We believe this is an important step to develop resilient clouds to deliver residentials phone and cloud services to end users. The architecture of the solution can be found here and it is a good read for all people interested in cloud and NFVs. The OpenNebulaConf is the perfect spot to meet up with other cloud professionals and take the temperature of the cloud computing field (check the material of 2016 edition if you want to know more). The first US edition of the OpenNebulaConf is happening this 2017, as one of two OpenNebulaConf editions this year, one in US and the other in Europe. The US edition will take place on June 19-20 in Cambridge, Massachusetts, and the European edition will be held in Madrid, Spain, on October 23-24. June is approaching fast! Have your seat prepared in Boston? If you are interested listening at what Harvard and Akamai have to say about their use of OpenNebula in their production infrastructures, then you need to move quickly and make sure that you get a place! This past month members of the OpenNebula team went to Prague, and did the first test on the field of the new tutorial format where the cloud is deployed within a public cloud provider. This helped a lot for people with Windows or 32 bit laptops. The next TechDay will take place in Madrid, hosted by Telefonica,and the speakers line up look promising. Stay tuned if you are in the area since you may be interested in attending the hands-on and the talks.